Last night I went 3-0 on my NBA picks and who ever says quit while you’re ahead? Why would I stop if I can just keep picking these games correct and winning more money? When you are on hot streak like I am, you just have to ride the hot hand, like Kemba Walker, and let shooters shoot. This could very well be the matchup this season in the Eastern Conference Finals. These are the two top teams in the east at the moment and this should be a very close game. These two teams are very evenly matched, the Raptors are 2nd in the league in field goal percentage with .486% and the Bucks are 3rd at .483%. Both teams have such great depth and both are going to go at each other's throats. 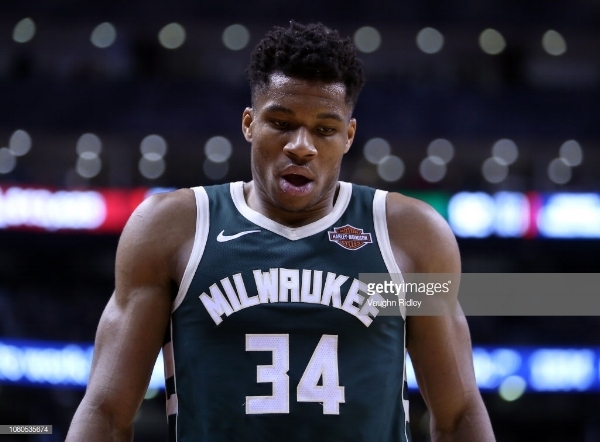 Giannis is having a fantastic season and he is making a real case to win the MVP. He is shooting an amazing .577% and averaging 26.5 points per game. Giannis always plays great against top players in the league because he always feels like he needs to prove he belongs in the same conversation as them. I think the Raptors are still going to win this game because they are the better defensive team, but it is going to be a close game. This game is going to come down to the last shot so I am going to take the Bucks +5 with extreme confidence. The Pistons are going to take this one at home. These teams are just too evenly matched for Detroit to be home underdogs. I love the way Blake Griffin has taken his game to the next level by understanding how the game is changing and working all offseason on his jumpshot. You need to worry about him all over the floor this season. The Pistons have given up the 2nd lowest amount of points through this point proving that they are a very good defensive team which is going to be huge playing against the team that has scored the most points in the league. However the Pelicans have also allowed the most points in the league. The Pistons are going to win this game tonight and edge there way up the Eastern Conference ladder.